The Stained Leaded Glass Company Ltd - Stained Glass Specialist in Greater Manchester - The Stained Leaded Glass Company, Bolton, Greater Manchester. Beautiful New Stained Glass, Expert Repairs, Double and Triple Glazing, School Projects, Church Protection. We love stained glass and would love you to share our passion as you browse our website. You will find it crammed with interesting articles and quality photos of beautiful stained glass windows. We are experts at the repair and restoration of old and antique stained glass windows in churches, historic buildings and private homes across Great Britain and send our windows around the world. So if you want beautiful new stained glass windows designed individually for you by a top stained glass designer and artist or your old stained glass or leaded light windows are broken and in need of repairing then call us or email for a quote. Our business is built on trust, repeat business and recommendations so you can be sure you will be satisfied at the end of the job. Bridge Coffee Stained Glass Window featured in The Bolton News! Surrounded by history at St Mary’s Church, Merton, London. New Stained Glass for St Patrick's Church, Rochdale. New Stained Glass at Tushingham-With-Grindley Primary School! How is a Stained Glass Window made? 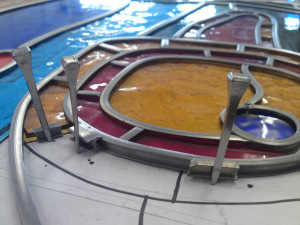 We are specialists in all types of Stained Glass and Leaded Light Windows. Designers of beautiful new stained glass designs for new and period homes. Inspirational church window designs and expert repair, remake, restoration and conservation of broken and damaged stained glass. If you'd like a free quote please get in touch. Stained glass is a traditional craft that has gone virtually unchanged for more than 1000 years. The ancient techniques of glass making, cutting the stained glass to shape, glass painting the individual pieces and joining the separate pieces using H section lead came to form one panel are still practiced by the crafts people and artists at The Stained Leaded Glass Studio. There are a multitude of skills required to make a stained glass window with the craftsperson being a truly master of all trades. Step 1 is to design the new stained glass window. This involves talking to the client and trying to find out what they want from the finished stained glass or leaded light window. This is where the talents and experience of a stained glass designer really comes into play. This could take some time with an initial design being produced then modified after consultation with the client until the final design is approved. So good communication skills are essential as well as patience and of course an artist hand and a vision for the finished window. Step 2 is to draw the design to the full size of the finished stained glass window. This demands excellent drafting skills to scale up the small design drawing to an accurate full size working drawing. Step 3 is to choose all the different types and colours of glass and to cut all the individual pieces. The coloured glass is hand cut using a simple glass cutter and the edges are finely shaped using special grozing pliers. Step 4 is to paint any design or design details onto the glass. The glass paint and stains have to be fired in the kiln at 725°c to fuse the glass paint to the surface of the glass. Step 5 is to join all the pieces of glass together by cutting and bending lengths of H section lead came around each piece. The lead is stretched to harden it before it is used and each intersection is lap-jointed together. Step 6 is to solder each joint together by applying a gas heated soldering iron to the joints in to lead on both sides. Step 7 involves cementing the panel using a special liquid black putty. This waterproofs the stained glass window and makes it rigid. The cement is applied into the gaps between the lead and the glass and cleaned off with the use of a chalk powder. The leads are cleaned then finally polished with carbon black to a fine lustre. Step 8 It only remains fit the window into place in wooden or stone surround. A stained glass window or leaded light window made or repaired using this technique should last many centuries. All the hard work is worth while when you see the finished stained glass window. Domestic and church Stained Glass designed and made, repaired, remade and releaded, protection and triple glazing in all areas. 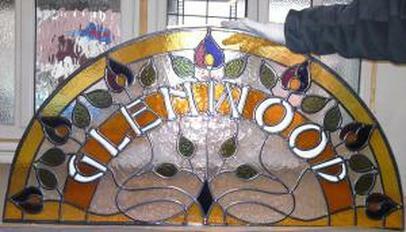 Stained Glass in Manchester, Bolton, Salford, Lancashire, Cheshire, Stockport, London and across the UK. The year started with a large triple glazing job in Leeds which is across the Pennine Hills from our base in Bolton. We carefully removed 57 stained glass panels form a beautiful Victorian home opposite Roundhay Park in Leeds. After extensive repair and restoration the stained glass panels were encapsulated into triple glazed units made from toughened Planitherm glass, with warm edge spacer bars and argon gas cavity to form state of the art insulated units. The original pitch pine window frames were in generally good condition so we deepened the rebates and fitted new beading around the glass units. The finished job looked great and the improvement in insulation instantly noticeable. Victorian stained glass is one of my favourite styles. I love the flowing lines and timeless colours. I designed and made a lovely panel for a fanlight above a door in Cheshire recently. The client wanted to incorporate the name of the house into the design so I choose a style of lettering reminiscent of the Arts & Crafts movement that looked just right for the design. We used antique cathedral glass in shades of amber, olive green and pink to give the panel an authentic appearance. The finished stained glass panel was finally encapsulated into a toughened glass triple glazed unit before being fitted into the original pitch pine frame. The finished window looked like it had always been there, another fine job! This is what stained glass is all about: working with the client to fulfill their vision and to compliment the period of the property. I am looking forward to the many stained glass classes I have planned for this year with new students coming to every class. There are lots of people coming on the classes who received vouchers as presents this Christmas so it will great to welcome them to the incredible world of stained glass. We will be working through the stages of glass cutting, leading and soldering to make a small sample window all in one day. So with the school art projects, church stained glass restoration and protection projects we have on at the moment its going to be a busy year. I am always surprised at the twists and turns in the life of our studio. The phone rang the other day with a call from the producer of the BBC Radio Lancashire John Barnes show. He was very interested in our work and wanted me to come on the show to tell the listeners about stained glass window making and how I started in the craft. I thought it would be a good idea to not just talk but demonstrate the craft on live radio. I was introduced to the broadcaster, John Barnes, and he interviewed me between playing music. I told him about how the coloured glass is cut to shape and joined using lead cames. He was also favourable to the idea of having a go at glass cutting so after another break for music he moved from his seat in front of the microphone and sat with me at the side table. I showed him how to cut glass and make a real stained glass window just like the ones we make on our stained glass courses and classes. He was very soon able to cut some strips of glass and I gave him 9 out of 10 for a very good first attempt. “ I feel like I am on the Generation Game, ‘Good Game, Good Game’”, he said in his best Bruce Forsyth voice. The travelling around the UK is an enjoyable and necessary part of the job with enquiries coming from as far north as the Shetland Isles down to the tip of Cornwall. With jobs coming in from England, Wales, Scotland and the Isle of Man for our beautiful hand made glass. The variety of jobs is always refreshing with stained glass protection, triple and double glazing always popular and church window repair jobs in demand. It is a shame to see the state of damaged windows but always a joy to see the progress of a restored window and finally see it back in place. We were working at Christ Church in Bury recently to repair and protect the beautiful stained glass windows in some high level windows. The damage had been caused by high winds ripping of old Perspex glazing. To get to the windows we had to reach over the roof with a cherry picker boom lift which proved to be more trouble than the stained glass repairs. The machine weighed 3 tons and had to be pushed in to position by hand. We had to negotiate our way over a high curb, soft grass, between grave stones and across the ancient Yorkshire stone paving. After much heaving and red faces we finally got the machine into position under the over hanging branches of a large tree by the side of the church wall. We then had to load up the machine’s basket and inch our way up and around the branches, over the roof and get into place between the church tower and the high level windows. The design of the building seamed to act as a window tunnel, with the gentle breeze turned into a hurricane force blast of cold air. The benefit of working from the cherry picker is that you can get to the perfect working height and carry all your tools and glass in one trip and also get to see the world from a different point of view, literally! We have just started work on another school art project. This time for a large private school which is in the process of building a new Junior Block. The window is to symbolise the new start for the school and is being inspired by a beautiful poem by Thomas Carlyle, “So here hath been dawning another blue day: Think, wilt thou let it slip useless away? Out of eternity this new day is born; Into eternity at night 'twill return.” I have been working with the staff and children to come up with designs for the new stained glass window and we are near to completing the artwork. I have chosen to use beautiful deep blue and violet shades of hand made glass for a morning sky which will contrast vividly with the orange, red and amber rays of the dawning sun. I also have a vision for using fusing techniques to intensify the effect of the suns rays by layering glass and heating it until it melts together. This will give a brilliant shimmering effect to the glass which will really catch the eye. 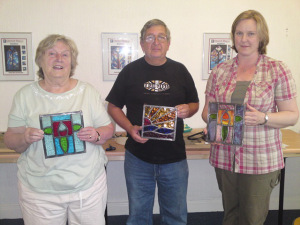 Thanks to Monty Don’s ‘Master crafts’ program we have been inundated by enthusiastic new students for our stained glass courses and classes. I love the fact that the ancient art of stained glass is alive and well in our modern age. There is something timeless about the effect of fabulous rich coloured glass when the sun shines through it that always makes you stop and look. Long may it continue. The best thing about this job is not just the fabulous windows we make, repair and restore but the fascinating people we meet. This week has been no exception. I have been working with a film maker working for the BBC who has a commission to film stained glass for the Songs Of Praise program. We are helping him with some close up shots of our windows in his studio and also at a church in Eccles, Manchester where we designed and made a new stained glass window documenting the history of the Parish. Also this week I met with a museum curator who asked us to help them with the renovation of their antique glass display cabinets. The skill of the original craftsmen is a joy to see with the fine hinges and lock mechanisms hand made in brass. They don’t make ‘em like that anymore, that’s for sure. I was able to look at the museums Egyptian collection whilst I was there, with fine examples of ancient glass on display. Can anyone tell me how they made such intricate coloured glass 3000 years ago? I have also been in discussion with a public school to finalise the start of a stained glass art project that I am running at the school. The children are going to help with the design for a new window we are going to make for the new building. The window will over look the main sports and dining hall so we will encapsulate the stained glass into triple glazed units made from toughened glass to protect them from flying footballs and dinner plates! Throw in a couple of visits to churches to inspect their damaged stained glass and advise on the best type of protective glazing using stainless steel wire mesh guards, polycarbonate or laminated glass, it has made for a very busy and varied week. The start of our year has been dominated by the freezing conditions and large snow falls across the country. We have had 9” of snow on our second day back which made travelling to the stained glass studio an adventure. Carl, one of our craftsmen, who lives about 5 miles away could not get his car out of the snow so walked it in to work through the drifts. Now that is what I call dedication above and beyond! Several of our jobs have been delayed. We were due to start work on site in Leeds to remove and repair some domestic stained glass before encapsulating them into argon filled double or triple glazed units. Our planned route across the Pennines was blocked by the snow, so we hope to start next week instead. We have been able to complete work in the studio to restore a beautiful Victorian Stained glass window to fit into a door and have made a good start on a deep carved sandblasted commission with a Traditional Japanese style design. As a stained glass designer, the enforced time away from site work has also given me chance the think about some new stained glass designs and church stained glass window protection projects for this year. We have large projects coming up in Wales, Nottingham and Manchester as well as schools art projects to look forward to. We are NOT planning to cancel to basic stained glass making courses planned for this month, which are almost full. I just hope we don’t get more snow the day before the courses that will prevent the students travelling. So, keeping going despite the ice. Happy New Year! Stained glass window protection, in strong winds….. The weather has played a major part in our plans recently. It seams like every time we plan work onsite that either a hurricane or tornado comes over the horizon. I have made several visits to Hillside Methodist Church, Brinscall near Chorley in Lancashire recently to make patterns for toughened glass protective glazing over the stained glass windows only to be faced by the worst the elements can throw at me. When you are 30ft up a scaffold making paper patterns to transfer onto hard board the last thing you need are strong winds and rain. The paper just blew around my hands and then turned into soggy mush, not very productive. I had more success with a trip to Dovers Green School in Surrey, to fit the new stained glass window I had designed with help from the year 2 children. We worked together to come up with ideas and stained glass designs to celebrate the 50th anniversary of the founding of the school. The result is a stunningly beautiful and colourful design with a bold rainbow, flowers, sun and even a helicopter. The head teacher, class teacher and children were all delighted with the window which I encapsulated into triple glazed unit made from toughened glass and fitted into the space above the main door to the large dining hall in the school. This type of school project is a real joy for me. To help the children to use their great ideas to come up with the design for their own window is just fantastic. I also showed the children how to make a small stained glass window of their own by using plexiglass, coloured film and strip lead to make up their design. The school put the finished windows on display in the windows of the hall along with a display of the art project. The Head Teacher, Sue Hillman, was very complimentary about the window and the whole project saying that she would recommend me to anyone who asked. Very kind, thank you all at Dovers Green School! What a busy four weeks we have had! Travelling the length and breadth of the country several times: I have spent a day with the Year 2 children at Dovers Green School in Surrey making stained glass in the classroom and developing ideas for a new window to celebrate 50 years since the establishment of the school. The children worked very hard to draw their ideas for the new window which I will use as inspiration for the new design. Also spent time at a local historic house, Smithills Hall where I gave a demonstration of stained glass making at the August Bank Holiday Garden Party then returned last week to run a course to make a stained glass sun catcher. The Bolton Museums Service commissioned me to put on the craft course in the beautiful surroundings of the Hall using the ‘Dome Room’ as a temporary classroom. I had a lovely day out in Criccieth, Gwynedd, Wales to discuss the restoration of an imposing grade 2 listed hotel. The front elevation boasts some wonderful leaded lights in the arts and crafts style which are in urgent need of attention. I took time to sit in the brilliant sunshine on the beach an gaze across the bay at the ruins of Criccieth Castle which stands on the rocky headland. Then returned home via the mountain roads around the foot of Snowdon, what a sight. 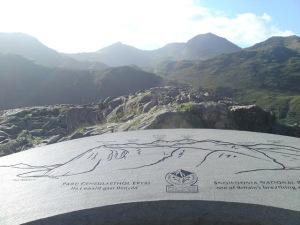 Stunning views across the lakes and valleys up to the highest peak in the country. 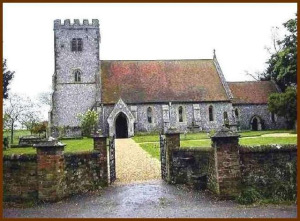 Then just this week we have been to on the road again working at churches in Shropshire, Bradford, Leeds and a fabulous historic church of St Mary & St Nicholas, Compton, Berkshire to protect the valuable stained glass windows with traditional woven mesh wire guards. Then today Stephen and Carl are over in Liverpool to remove some domestic stained glass windows for restoration and encapsulation into double and triple glazed units. No time to sit still, must get ready for our stained glass course tomorrow for our intermediate students who will be finishing their creations during the day.